Don't let the dancing baby Moogle distract you. Why would you buy the Kung Fu dress when you could get the Spiky Suit for less? Sprite finally makes it home! 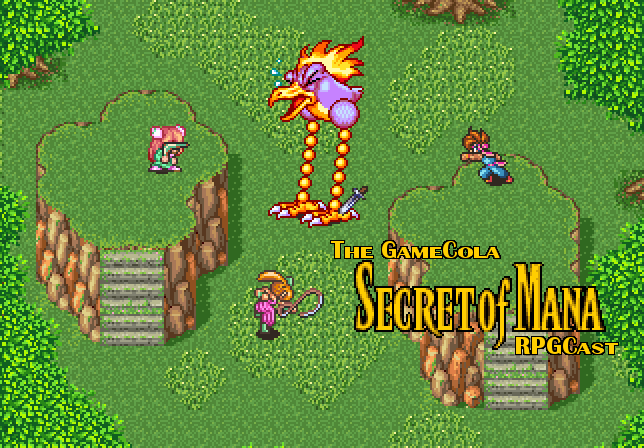 All your favorite Secret of Mana moments (and some you never knew) are waiting just below! Or you can hop over to iTunes and add it to your device of choice to listen later. And why not get all your friends to join in the fun, too? Share our post on Facebook, reTweet our Tweet on Tweeter, or just use the #GCRPGCast hashtag to let everyone know you’re listening and find more friends to share the experience with! Speaking of which—you can now join the staff and other fans on the GameCola Discord! Stop on by and share your favorite moments from the episode. John Rizzi counts down and breaks down GameCola's favorite Videogame Soundtracks in Part 1 of this Top 20 list.